Multifocal contacts, commonly called “bifocal contacts”, have been on the market and changing patients lives for around ten years. But what are they, and how do they work? While they are technically not a “bifocal” as they contain several prescriptions (not just two), they are a simple design that will improve your vision at any range, from distance to computer to up-close reading. 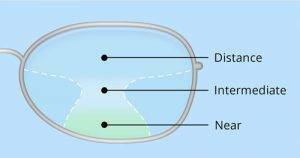 In this aspect, they are comparable to a progressive eyeglass lens. However, they are very different from progressive lenses in the way that they work. Progressive glasses require you to look down into the lower half of the lens while keeping your chin raised in order to see something up close. For example, while reading a book or working on a tablet. This is because only the lower portion contains your reading and computer-distance prescriptions. Multifocal contacts do not require this; in fact, you can look up, down, or in any direction and still see something clearly at close range. 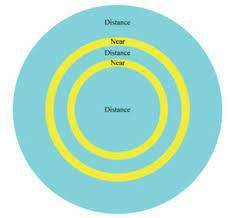 This is because in multifocal contact lenses the size of your pupil controls vision at these various ranges. Therefore, the only thing that can influence vision while using them is lighting conditions. And who doesn’t need more light to see things these days! Patients come into our office every day wearing single-vision contact lenses with “cheaters” over them in order to read. Most people are not even aware these types of contact lenses exist, but they do, and can dramatically change the way these patients experience vision at every distance. We offer all patients the opportunity to try our latest in multifocal contact lenses. In the decade-plus that they have been in the mainstream market, they have improved greatly, partially due to their demand and popularity. We offer multifocal contacts in different throw-away modalities to fit your lifestyle and wearing needs: monthly disposable as well as daily disposable. Have dry eye and want to wear multifocal? We have multifocal contact lenses in materials specifically designed for patients suffering from dry eye. Contact lenses are constantly changing, just like all technologies, and will continue to do so moving forward. So don’t settle for monovision or the hassle of cheaters over your contact lenses. Ask about our multifocals and if they are right for you.